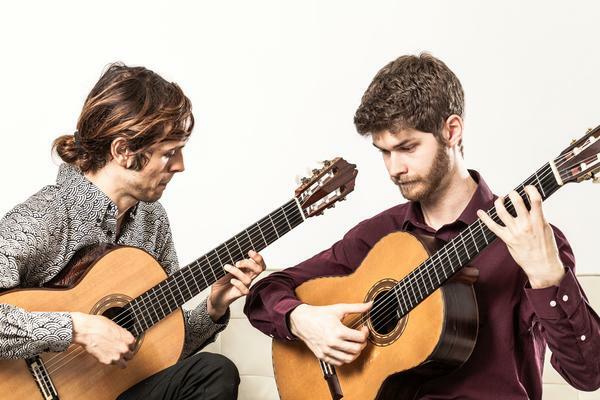 Vickers Bovey Guitar Duo have been described as performers 'with truly uncanny unanimity' (Ivan Hewett, Daily Telegraph) and 'with astounding exquisiteness' (Paul Driver, Sunday Times). Julian and Dan first met studying at Birmingham Conservatoire where they both received First Class Honours and the Principal's Prize, continuing their studies with a joint Masters at the Royal Academy of Music, graduating with Distinction and the Performance Diploma. Winners of multiple awards, the duo have been selected for the Worshipful Company of Musicians' Maisie Lewis Prize, the Tillett Trust Young Artist's Platform, which saw them make their Wigmore Hall debut in February 2017, the 2017 Park Lane Group concert series at St John's Smith Square, the Concordia Foundation Young Artist Scheme and the Royal Academy of Music's Club Prize in 2016. The duo are prize winners in the International Ensemble Competitions of the Guitar Foundation of America and Braga Guitar Festival. United by a love of new and contemporary music, the duo have premiered numerous works, including Michael Finnissy's Normal Deviates, Joe Cutler's Everyday Music, Mario Ferraro's On That Old Oak by the Roadside and Ryan Probert's Thirty-Six Views of Mount Fuji and The Fields Where Silence Has Lease (BBC commission).